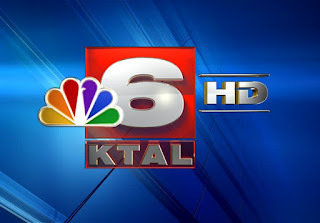 KTAL/Channel 6/Shreveport debuted news in High Definition today. Included in the transformation is of course a new set, graphics and music. From what I am seeing right now during the 10pm newscast it looks like the best think KTAL has ever put on air. The set isn't overbearing with just one color like KSLA and KTBS. Who knows this could put KTAL back in the news game! As reported here first earlier this month Wes Moore has officially announced he's leaving KTHV. On tonights 6pm news cast he and the 11 anchor team talked about his leaving. Moore says he is leaving TV broadcasting and moving to radio. Well it looks like it's finally gonna happen. KTAL/Shreveport Chief Met Todd Warren commented on his facebook page the debut of HD is gonna happen tomorrow! KATV's giveaways seem to have paid off during the May Sweeps. Arkansas Business.com reports Channel 7 won each and every news time slot. The most drastic change was in the early morning hours. KATV was up 12 points while Channel 11/KTHV was down 12 points in that time slot. For more numbers see the story at Arkansas Business.com. KHBS/KHOG-TV’s 40/29 News Sunrise was the most watched morning news in the Fort Smith/Fayetteville market during the May 2012 ratings period. 40/29 News Sunrise won the 4:30 – 7:00 a.m. time period in both the Adults 25-54 and Adults 18-49 ratings. “Our team has worked very hard to deliver a morning newscast that reflects the needs of our viewers,” said KHBS/KHOG-TV President and General Manager, Brian Sather. “Our morning newscasts provide lots of weather and two live reporters covering the most important overnight developments, and it’s clear from the May ratings, viewers appreciate what we’re doing,” added Sather. In other newscasts, 40/29 News at 5:00 p.m. won its time period in Women 25-54 ratings, 40/29 News at 6:00 p.m. had its best performance since May 2011, while 40/29 News at 10:00 p.m. won its time period on both Saturday and Sunday nights. ABC’s Good Morning America is Fort Smith/Fayetteville’s # 1 network morning news. In May, GMA won the 7:00 a.m. – 9:00 a.m. time period in all major demographics with a 2.7 rating/26 % share in Adults 18-49, a 3.8 rating/32% share in Adults 25-54, a 3.5 rating/24% share in Women 18-49 and a 4.7rating/31% share in Women 25-54. GMA has been # 1 for 16 consecutive rating books in Adults and Women 25-54, and 19 consecutive weeks in Adults and Women 18-49. The View was the top-rated program in the 9:00 a.m. – 11:00 a.m. time period in major women demographics. Kelly ranked #1 in the 9:00 a.m. – 10:00 a.m. time period with .8 rating/12% share in Adults 18-49, a 1.4 rating/16% share in Adults 25-54 and a 1.4 rating/13% share in Women 25-54 . The View topped the competition with a 2.1 rating/27% share in Women 18-49 and a 2.5 rating/23% share in Women 25-54 . The Ellen DeGeneres Show won the 3:00 p.m. hour in all major demos, and Dr. Oz continues to be # 1 at 4:00 p.m. with a 1.7 rating/17% share in Adults 18-49, a 2.4 rating/18% share in Adults 25-54, a 3.0 rating/22% share in Women 18-49 and a 4.1 rating/25% share in Women 25-54 . In primetime, ABC’s Grey’s Anatomy was the top-rated drama among major women demographics, reaching an 11.4 rating/28% share in Women 18-49 and a 10.9 rating/23% share in Women 25-54. Among all new dramas, Once Upon A Time and Revenge ranked # 1 and # 2 respectively, in Women 25-54 demographics. When it comes to comedies, Modern Family was top rated in Women 18-49 demographics, scoring a 9.0 rating/19% share. Nielsen Media Research measures television station viewing four times a year. May is considered by many to be the most important ratings period. The research findings include viewing levels for a host of different demographic groups along with households. Adults 25-54 is the most common demographic group and one that is highly sought after by advertisers. Adults 18-49 is another demographic group critical to many key advertisers. KTAL newscast will be broadcast in HD starting this Friday. 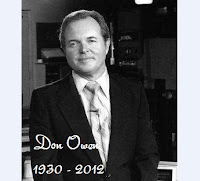 Source: KSLA -Longtime KSLA news anchor and former Public Service Commissioner Don Owen has passed away. 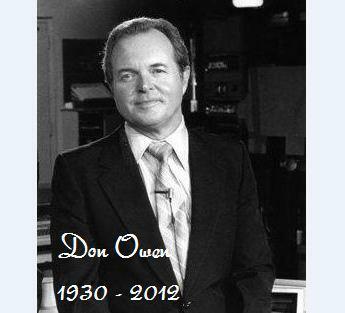 Donald Lynn "Don" Owen, who also served as news director during his 30-year tenure at KSLA, died Sunday morning of complications from pneumonia. Owen resigned from his position at KSLA News 12 in 1984 to run for and win the District 5 Public Service Commissioner seat. He was re-elected twice more, serving three six-year terms. Don Owen is preceded in death by his wife, Dagmar, of 47 years, and survived by his son Darrell, daughter Donna and four grandchildren. Heard through the grapevine that Summer Knowles of KSLA TV in Shrveport is heading to CBS station in Miami. Starting work Monday! Must be true as she has posted a pic of her new Florida driver's license on her facebook page. Veteran sportscaster Mike Irwin has joined the Razorback Nation sports team. In 1976, Irwin became the first television sports reporter to cover Razorback athletics on a daily basis from Northwest Arkansas. Over the past 37 years his name has become synonymous with cutting edge reporting and expert analysis of Hog athletics. KARK, KNWA, KFTA & KARZ are proud to welcome him aboard. "I have admired the Razorback Nation concept for quite some time," Irwin said. "If you do what I do for a living why would you not want to be a part of the largest television sports staff in Arkansas, one that is totally focused on bringing the very best coverage to Razorback fans? I am fired up to be a part of this team." Got a news tip...Use the anonymous news tip box to send it in! Source:KHBS/KHOG News Release: KHBS/KHOG-TV announces the launch of its completely redesigned 4029tv.com, Northwest Arkansas’ and The River Valley’s most-used local news website according to Quantcast.com. 4029TV.com has been completely reengineered to offer an easier-to-navigate and more user-focused experience. 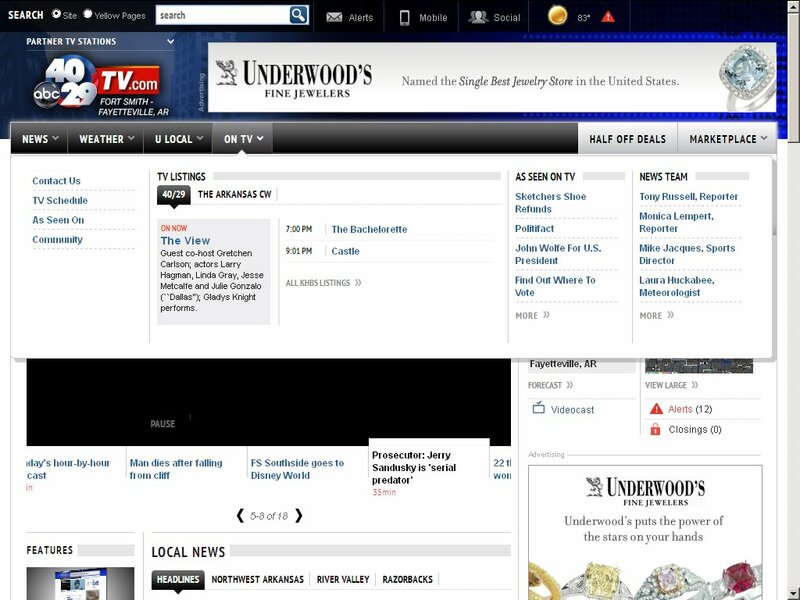 The new and improved 4029tv.com now features a sleek, clutter-free design with an enhanced layout for late breaking stories, videos, slideshows and more. “The relaunch of 4029tv.com is an important step in our commitment to provide superior late breaking news and weather coverage to our market,” said KHBS/KHOG-TV President and General Manager, Brian Sather. “We’re offering an easy-to-use experience, not only for getting important information, but also for commenting on stories, and communicating with our news team. KSLA reporter Erin Stevenson posted on her personal facebook page that she's accepted a job as a reporter in Dallas. she's been working in east Texas lately and covered things like the wildfires and Celeste Lowe's case. Moore to leave KTHV?....What Happens Next? I hate goodbyes, so instead I'll say thank you! I came to Arkansas a little more than two years ago unsure of what to expect. I'll leave here today with my expectations exceeded in every way possible. Arkansas, you have some of the kindest people the world has to offer! But as you all know, there's no place like home! My family and I are moving back to Boise, Idaho. It's where my husband and I met and where we can't wait to raise our little guy. I'm also saying farwell to television news to enter the world of real estate; a career that will allow me to spend more time with our baby. My entire adult life has been spent in a newsroom. Its afforded me the chance to see the country, forge dear friendships and have countless "bucket list" experiences! I'm so thankful to have had the chance to cover your teams here in Arkansas. I only hope I did them justice! As I start this next chapter, I'll take a bit of the Natural State with me. My little boy will always be a native Arkansan! You all have a friend in Idaho! Woo Pig Sooie!